Moldex® 2307 N95 Particulate Respirator With Exhale Valve - Low Profile Stay Cool On The Job. Workers stay cooler with an exhale valve that reduces hot air build up. Theres less breathing resistance and workers dont have to break midshift to cool off. Easy Fit, More Comfort. 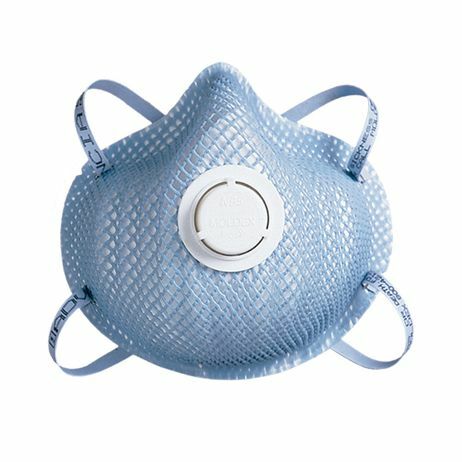 The molded nosebridge with soft foam nose cushion provides the wearer an easy, comfortable fit. Theres no metal noseband to adjust and the seal is maintained without pressure points. Last Longer, Use Fewer. The exclusive Dura-Mesh® shell protects the filter media so it stays cleaner-looking longer. The shell resists collapsing, even in heat and humidity so the respirator holds its shape longer. The result is fewer respirators used and lower costs. Suitable For Welding. 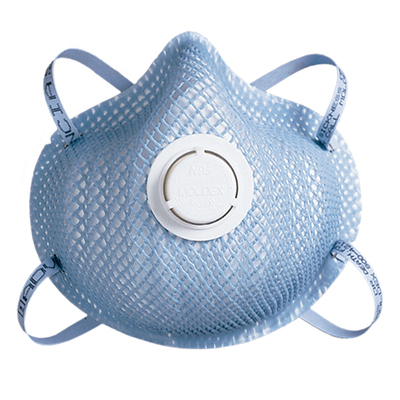 2300 Series Particulate Respirators are suitable for most welding applications. Dura-Mesh®s Dura-Mesh® shell resists collapsing in hot humid conditions common to most welding applications. Meets heat and flame resistance in accordance with ANSI/ISEA 110.2003 Section 7.11.1. Applications Hot, humid and dusty environments such as welding, soldering and brazing, grinding, sanding, sweeping, bagging, stone quarrying, metal machining, cement, underground mining, polishing, buffing, lime, poultry and textiles. No oils present. Note: For areas with oils present, you must use an R or P respirator. Call our Technical Support Department for more details. Features • 100% PVC-Free. • Available in three sizes to fit most workers in today's workplace. • Exhale valve lets workers breathe easy and stay cool. • Exclusive Dura-Mesh® shell resists collapsing in heat and humidity. • Molded nosebridge seals easily and comfortably without a metal noseband. • Facepiece is naturally contoured without pressure points. • Soft, foam nose cushion for added comfort. • Softspun® lining for increased comfort and durability. • Suitable for most welding applications. • Meets heat and flame resistance in accordance with ANSI/ISEA 110.2003 Section 7.11.1.